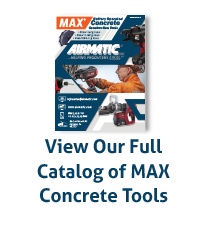 MAX® Rebar Cutters, Hammer Drills, and Impact Drivers On Airmatic Inc.
MAX USA CORP, located in Long Island, NY, is the distribution arm in North, Central, and South America of MAX® CO LTD, which is headquartered in Tokyo, Japan. MAX® is a leading international manufacturer of construction tools and office products. With more than 65-years of manufacturing experience, MAX® has been developing innovative, state-of-the-art products that set the industry standards for quality and reliability.